Appearance: This image is probably the final pose in a ritual dance of praise and jubilation called the "Recitation of the Glorifications". Meaning: The use of the henu sign to show "praise" or "jubilation" has been found in all periods of Egyptian art. An enthusiastic form of acclamation and greeting, priests and officials welcoming the pharoah as he appeared before the court often were shown in the pose. Figures greeting the sun-god as he rose above the horizon were also portrayed in the henu-pose. The gesture was especially associated with a series of deities known as the "ba of Pe and Nekhen" Traditionally, they are shown performing the dance. 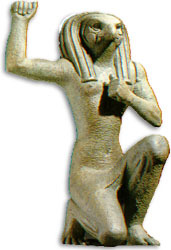 Pe a name for the Delta city that is better known as the Buto and Nekhen is the Upper Egyptian city of Hierakonpolis. These deities were in the form of three men, one with the head of a falcon and one with the head of a jackal. They are typically shown as coronations scenes and at the birth of the pharaoh.